A new children's book available now! Penguins are one of the most lovable birds on Earth. Welcome to Penguin-Pedia! The greatest source of penguin information on the web! Our goal is to promote awareness of these precious animals. By bringing penguins closer to those who love them, we hope to illustrate the penguin's beauty and grace, as well as the differences that exist between the seventeen species. We hope to increase the general public's knowledge of the dangers and hardships these animals face and what can be done to save those species that are endangered. The most comprehensive penguin book to date! A must have for any penguin lover! If you're someone who's interested in learning about penguins or even just like looking at them (and I'm assuming you are if you're reading this review) then this is a book you must own. The book is a combination of pictures, facts, and stories of the author's travels as he compiled this collection of information on the world's penguins. The book does a great job of providing quality facts about the various species of penguins in a well organized format that is easy is follow. While the fact summaries are top notch, the true highlights of this book are the photos and the author's commentary. The book even tells you where and how you could go see each of the species around the world on your own! Unfortunately most of us don't have the time or money to do this :( .... Luckily the pictures are so good its almost like we got to join Mr. Salomon on his journey. High definition close up photos of the different species are found on every page of the book (literally every page) and they are simply amazing. When reading the author's commentary you can tell how much time and effort was put into producing this book, and it clearly shows in the finished product. Do yourself a favor and read Penguin-Pedia (or at least look at the pictures), you won't regret it! This Book is about various types of penguins, their corresponding habitats, and all things penguin. David Salomon crafted the perfect mix of regal photography, personal experience, and facts. Penguin-Pedia is versatile and has something for everyone; flavorful for a child, educational for a student, and informational for a traveler. As a travel enthusiast I personally enjoyed the exotic locations. Salomon used up close photography in perfect lighting which made the pictures come to life. I strongly suggest reading this book and using it as a resource. This is the definitive resource for all images penguin. A truly inspirational visual tour-de-force, Salomon takes us on a surprisingly emotional aesthetic journey through the world's supreme penguin enclaves. I can only hope that a second edition is imminent. My coffee table needs more penguins. This is really an amazing book. I bought it on Amazon a few months ago, after having some trouble finding all the information I needed for a report on Penguins. It's unprecedented for a book to have so much detailed information about every single penguin species. The fact that it is just bursting with hundreds of colorful photographs really brings the subject to life as well. I figured I'd use the information and then throw the book on my shelf, but it's taken a prominent spot on my coffee table- to many complements! This is a great reference book about Penguins, but is attractive enough that I find myself repeatedly flipping through it just for the pictures. Penguin -Pedia has fabulous photos, facts, and personal observations. I got it for the pix, but got caught up with the information. 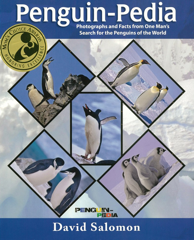 For each of the 17 varieties of penguins, the book has a fact page, filled with close up photographs plus information about the genus, population, locations, habits and more. . The following page is the author's personal reflections and observations. Author Solomon,writes that he has circled the globe and has seen and photographed all seventeen species. Simply fascinating. And I thought a penguin was just a small bird dressed up in a tuxedo! Ask Us a Question! If you have any penguin or Penguin-Pedia questions, please contact us. We will be glad to answer them!